Nissan Maxima 2000-2003 problems, fuel economy, handling and ride, what to watch out for when buying used. Nissan Maxima is a mid-size front-wheel drive premium sporty sedan with a strong V6 engine. It handles well and has a firm but quiet ride. The interior is spacious and upscale. Front seats are comfortable. Available features include a power driver's seat with memory, Bose audio system, auto-dimming rearview mirror, heated steering wheel, trip computer, steering wheel mounted audio controls and navigation. 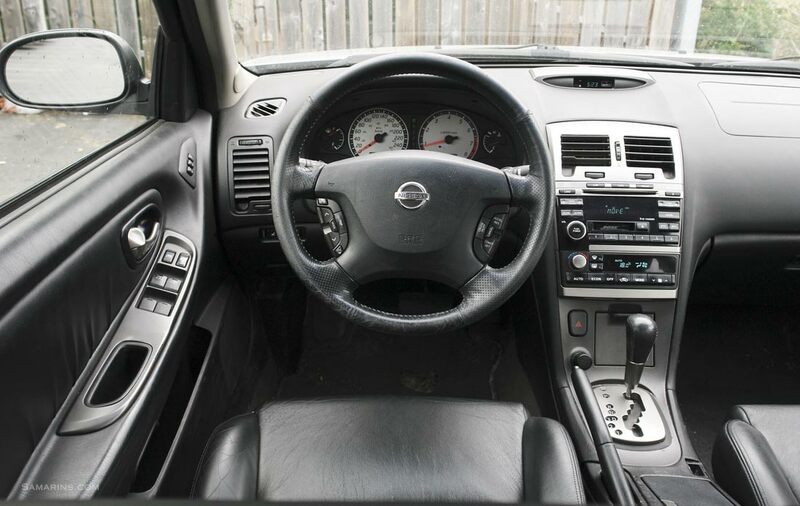 Nissan Maxima holds its value well and is one of the rare V6 sedans that you can find with a manual transmission. Fuel economy is average for the class. Competitors include Acura TL, Honda Accord, Toyota Camry and Mazda 6. Reliability is about average, however some common problems could be quite expensive to repair. Read more below. Handling and performance: On the road, the Maxima handles well with solid sporty feel. The V6 engine is very strong, with good low-end torque and plenty of passing power. The ride is firm and fairly quiet. On the downside, you might feel torque steer on hard acceleration, especially with the manual transmission. 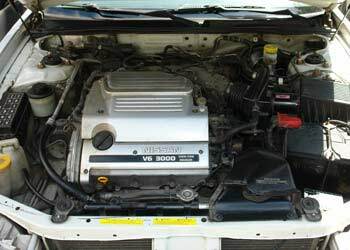 Engine: The 2000 and 2001 models were equipped with the 222-hp 3.0L V6 DOHC (VQ30). For 2002, the Maxima received the 255-hp 3.5L V6 (VQ35), which is to this day used in many Nissan vehicles. Even if you look under the Nissan GT-R's hood, its VR38 looks very similar and uses the same basic design and some of the valve train components as the VQ35. Overall, both VQ30 and VQ35 are strong solid engines. Both have a timing chain instead of a timing belt. However, this engine needs to be maintained very well to last, otherwise it could be quite troublesome at high mileage. Timing chain issues are not uncommon. Replacing a timing chain is very expensive. If you are buying a used Nissan Maxima, especially with high mileage, watch out for whirring or rattling noises from the timing chain area. A good engine should be quiet. 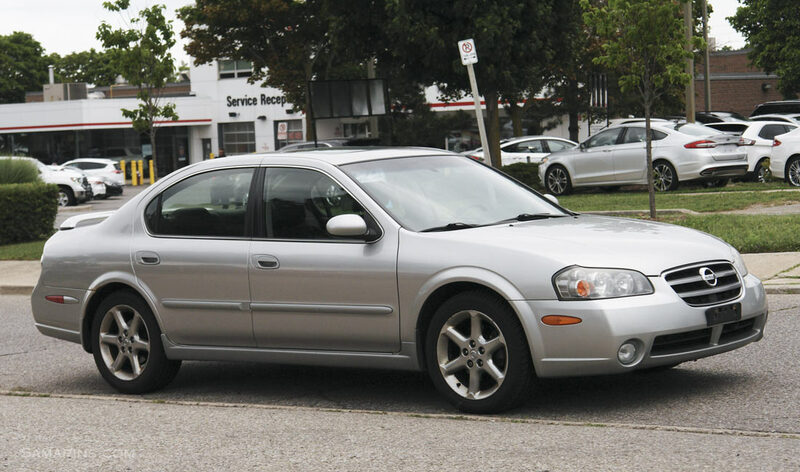 Fuel Economy: The 2003 Nissan Maxima with an automatic transmission is rated at 17/24 mpg or 13.8/9.8 L/100 km city/highway, which is below average for a family sedan. To compare, the 2003 V6 Honda Accord automatic has the EPA rating of 19/27 mpg. However, the 2003 Maxima with a manual transmission gets much better mileage: 19/26 mpg or 12.4/9.0 L/100 km. Safety: Antilock brakes are standard; traction control is optional. Side-impact airbags are optional. In the NHTSA frontal crash tests the 2000-2003 Nissan Maxima received four stars out of five for both the driver and the front passenger. Pros: Powerful V6, available with a manual transmission, sporty handling, roomy upscale interior, standard ABS, available heated steering. Cons: High maintenance and repair costs, torque steer on acceleration, firm ride, reliability could be better. Overall: At this age, a high-mileage used Maxima could be quite expensive to keep. If you want a used family sedan, consider something like a used Toyota Camry or Honda Accord, preferably with a 4-cylinder engine. A used Mazda 6 is not a bad choice if you like sporty handling. Acura TL is another upscale sporty mid-size sedan. Nissan Maxima problems: Common problems include a faulty alternator, noisy timing chain, oil and coolant leaks and the 'service engine soon' (emission control related) issues like bad camshaft position sensor (CMP) or crankshaft position sensor (CKP), dirty air flow sensor, faulty ignition coils, catalytic converter, EVAP system issues. What to look for when buying a used Nissan Maxima: When checking a used car, watch for leaks; coolant leaks are not uncommon. Check all the electrical accessories including power windows, heater controls, air conditioner, etc. When the engine is started, watch out for a blue smoke for the exhaust and noise coming from the timing chain area. During the test drive, make sure to test the automatic transmission very carefully; all shifts should be smooth. When test-driving a car with a manual transmission, try accelerating and decelerating in every gear and watch out for noises. A noisy wheel bearing could produce a humming that is more noticeable at high speeds. If the 'Service Engine Soon' light is on, the problem must be investigated before you decide to buy a car. Read our illustrated used car buyer's checklist for more tips on what to look for. Before buying a car, have it properly inspected by a mechanic. Maintenance tips: Touch-up chips and scratches in the paint to prevent rust. Keep all the fluids clean and topped up. Have the oil changes done regularly. The owner's manual for 2003 Nissan Maxima recommends using SAE 5W-30 oil for all ambient temperatures. Coolant leaks are not uncommon; check the coolant level regularly. Nissan original parts are the best fit for this vehicle; using cheap aftermarket parts can lead to problems. This page at the US Nissan website lists maintenance schedules. This thread at Maxima.org contains many DIY instructions. Have your car inspected at least once a year in a repair shop to keep it safe. If your Nissan Maxima has the Service Engine Soon light on with the codes P0340 or P0345 and cuts out intermittently, there might be a problem with the camshaft position sensor (CMP), which was fairly common. with Aluminum block and aluminum heads.